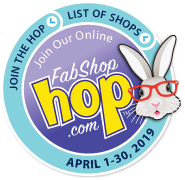 The April bunny is loving the Pattern Sale Page! PRIZE WINNERS WILL BE ANNOUNCED IN OUR NEWSLETTER!!! Customers only need to sign up once to be entered!